The XS Compact Second-Stage housing is made of durable non-corrosive polymers, and has a dependable downstream demand valve mechanism. The flow of air is channeled to the mouthpiece by injection, creating a Venturi effect enhancing the performance. The 2nd stage comes with a deviator that acts on the Vneturi effect, with the dive/pre-dive adjustment function. Large soft purge cover allows easy clearing of 2'nd stage and a comfortable silicone mouthpiece. 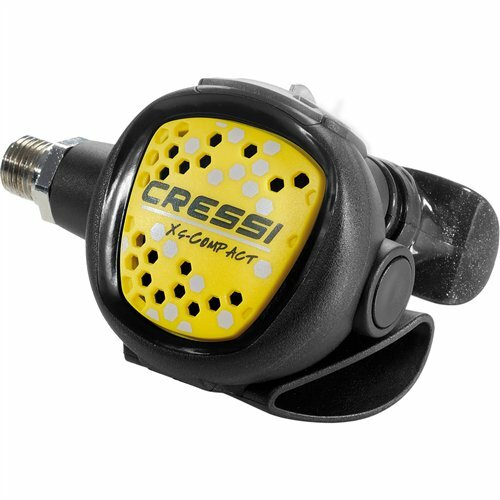 The XS Compact regulator comes with an 3/8" hose, Owner's Manual and a limited lifetime warranty. In the box: Octopus XS Compact second stage, 3/8" yellow hose and owner's manual. Reliable downstream demand valve made in Italy with durable hi-tech polymers. Compact and really light, perfect for travel.